Kaffe Fassett, perhaps the most celebrated textile artist in the world today, is known above all for his mastery of color. 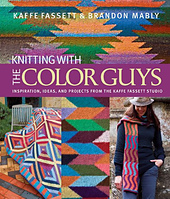 In his first book collaboration with Brandon Mably, his studio design partner, Kaffe finds exciting inspiration in the textures, shapes, and patterns all around us. You can find Kaffe here. That question which is often asked, seems to imply that I find inspiration in one specific place, where as good ideas are everywhere. Decorative Arts Museum's are a good place to start but any street or the countryside will give you so much. Simple stocking stitch, as colour does all the fancy work I need. I notice a lot of knitters are large so I often design big jackets and long waistcoats to suit those generous shapes. I've noticed that your new book is on accessories and home decor projects. Could you tell us a little more about your design focus? I'm most interested in colour and pattern so scarves, throws, shawls give me a big canvas to express myself with. I love to look at other designers but usually I can take them in at a glance. I love complexity which I rarely see in others work these days. Sad, if knitters are encouraged they can do what I do very well. I've seen people who weren't told it was difficult, try a complex design as a 1st project and succeed! I do most of it myself these days. I used to have 2 or 3 knitters but I'm faster than most so can do my own sample swatches. Not really, though a lot of people in publishing and yarn production help me. Plus a network of shops around the world. I have tried to have a shop and failed miserably so learned to keep my business simple and in my control so I admire any business that can stay strong and maintain it's original flavour. The Missoni family are doing it well. Peruvian Connection is my favourite these days with their rich hand knitting. It certainly helps promote my books, classes, and exhibitions and my email newsletters keep everybody up to date with new work, fabrics and events. Not terribly well. I am a bit of a workaholic but I love what I do and it can be very therapeutic. I try to go exercising and visiting friends and family whenever I can get away. I don't get that much and hate it as much as anyone else. I always try and calm down and learn from it. As I lived very frugally at first it didn't take long to support myself. I was good at drumming up business. If you love it and focus it can work, but you have to be very savvy about publicity and inspire people to commission you to do work and try everything at first. Most of all don't be afraid to use colour!